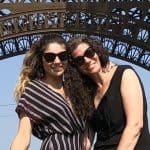 This is a budget wedding guest post by Kathryn Mancewicz, who has the personal finance and budget travel site Money and Mountains. Kathryn and her husband will be adventuring (and living!) in their amazing restored 1977 VW Bus soon. Weddings can be insanely expensive. Just ask any bride! As if planning a wedding isn’t stressful enough, the expenses incurred on average are enough to send even the most level-headed bride over the edge. Did you know that the average cost of a wedding now exceeds over$30,000?! When you read stats like that, it is easy to feel discouraged, but I am here to reassure you that having a budget wedding IS possible. Not only will saving money on your wedding costs set you up better financially, but it will help you to be better at budgeting your finances as a couple so that you don’t run into money fights down the road. 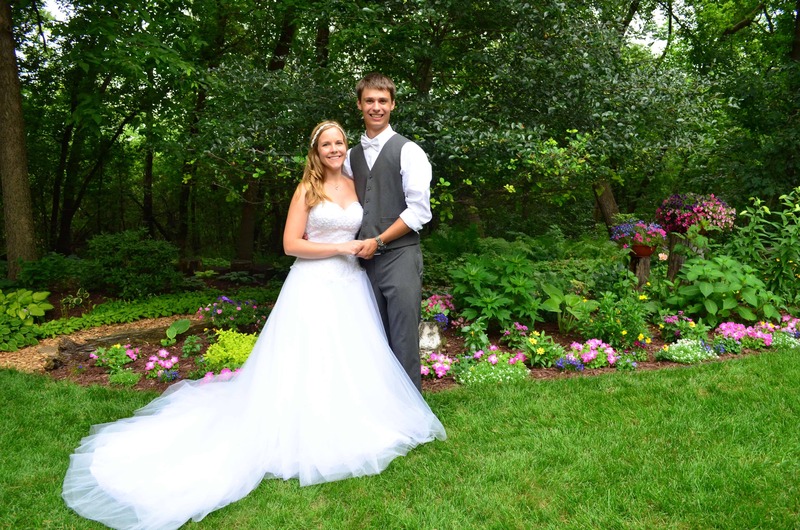 Having a budget wedding is sure to start your married life off on the right foot! I remember the feelings you may be feeling right now, because that 4 years seemed to have been yesterday. Planning a budget wedding is a LOT of work. Planning any wedding is a lot of work, but when you don’t want to go into debt doing it, you really have to go above and beyond in your planning to make it happen. It can be exhausting and stressful and amazing to plan your dream wedding on a budget all at the same time! But when that special day comes, all of your hard work will be worth it. I promise! The first step to making sure your budget wedding goes smoothly is to start planning well in advance. Venues tend to book up very quickly and can be one of your biggest costs. To ensure you are able to book a place you can actually afford, you’ll need to start looking early. This way you will have time to search around and find the right venue at the right price rather than having to take whatever is available for your desired time frame. When I got married, I started looking at venues over a year in advance. This allowed me to find something that was extremely affordable. In fact, I actually found a venue for the ceremony and for the reception that cost me a whopping ZERO DOLLARS! Yes, you read that right, my venues were both FREE! I bet you are saying to yourself that there is NO WAY I didn’t have to pay for my venue unless I had it in some dump. I’ll just let these pictures speak for themselves. The ceremony was held in my parents’ amazingly beautiful backyard. My mom worked SO hard, starting a year in advance, on getting her gardens immaculate so I would have the perfect place to get married for my budget wedding. While I know not everyone has the luxury of having a place like this to get married, you might be surprised with what you can come up with or who you may know as a connection when you begin thinking outside the box. For our reception, we had it at my grandparents’ church. So yes, if you look closely you may see some basketball court lines on the ground, but if you ask me, saving over $5,000 (the ENTIRE cost of my wedding and the AVERAGE cost of a venue) was totally worth it. Plus, I was still super happy with the location. Besides, when you think about it, the important part about your wedding day isn’t where it happened, but WHAT happened. Soon you will be married to your BEST friend, and that’s what really matters at the end of the day! Another important thing to consider and ask about when searching for a venue is what sort of restrictions they have. For example, some venues will only allow you to work with a certain caterer or group of caterers. Even if the venue is affordable but the caterers you have to choose from aren’t you may end up paying more than you expected. Another thing to consider is that some venues won’t allow you to bring in any non-certified food products. For example, you couldn’t get a cake from a non-certified baker at some places. 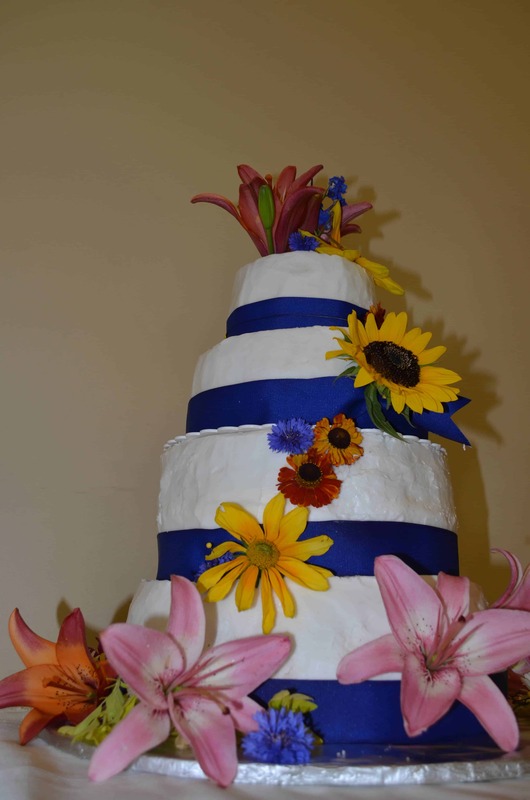 My wonderful grandmother actually made my wedding cake for me which was another huge money saver. If I had a venue that wouldn’t have allowed me to bring this cake in, my overall price tag would have gone up by about $500-$1000 or more. Depending on when you get married there are several options to consider for flowers. Some people choose to go with silk flowers or smaller bouquets. What I did to save a TON of money was bought my flowers from the farmers market! For a summer wedding, doing DIY flowers is an amazing option. I spent a total of $60 on all of the bouquets for myself and my bridesmaids as well as flowers to decorate the tables at the ceremony and the reception. If you have never arranged flowers before, you will want to buy a bouquet or two beforehand to practice and get them to look just right. It is also important to make sure you have somewhere cool to store your flowers until the ceremony so they don’t wilt. Because that would be really sad! 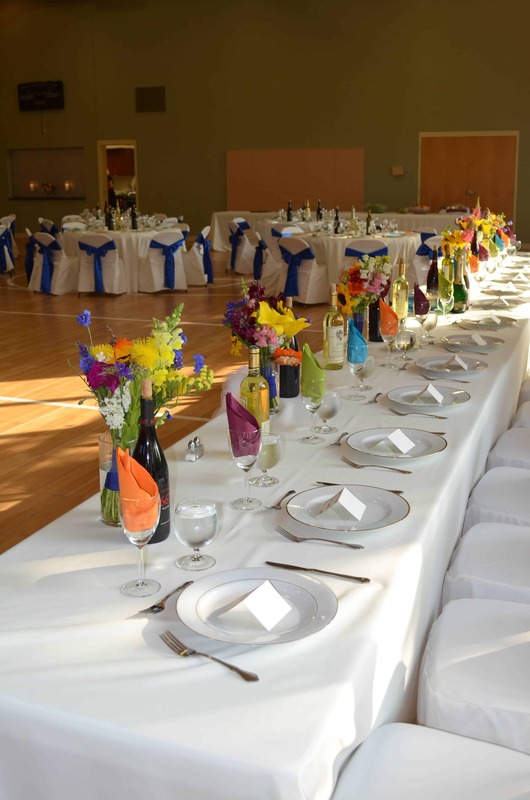 Just like it is important to start well in advance to find a venue for your budget wedding, you will also want to start your search early for a caterer. The cost of food for a wedding can add up extremely quickly and is often a significant expense. One way to keep this under control is by searching around for a good yet affordable caterer. I was really fortunate to have a family friend who caters, and so I was able to get a significant discount and basically just had to pay for the cost of food. Also, the ladies at my grandparents’ church, where we had the reception, volunteered their time to help serve food, cut the cake, and clean up. It was seriously amazing. Definitely something worth looking into if you are religious and your church has a setup which could house a large group of people. The last tip I have for you here is to use your connections. People are generally really excited for you on your special day and would be happy to help make your dream wedding become a reality! I was able to use some connections to save money on a DJ, a photographer, and as I already talked about, venue, cake, and caterer. All of these connections and help from others is what allowed me to save tens of thousands of dollars and avoid going in to debt just to get married. Since we already had to work on paying off tons of student loans, starting off our married life with a loan for our wedding was the LAST thing we wanted to do. Although it sometimes feels weird to ask people for favors, I think you might be surprised by how many people are willing to pitch in to make your day absolutely perfect! And if you start to feel stressed out amid all the planning, go back to what really matters. Your wedding isn’t about the venue or the flowers or the music. It is about making a lifelong commitment to that special someone in your life! And that is where the real magic happens!